Chris Martin has truly enjoyed a life in drum corps. 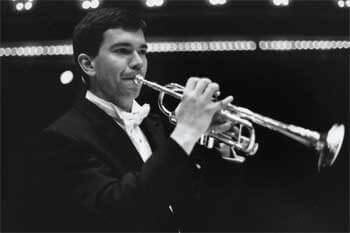 The 30-year-old musician, who grew up in the Spirit organization and marched there in 1993 (his father, Freddy, is a true drum corps legend -- he founded Spirit and now consults with the Phantom Regiment), was recently named the principal trumpet player of the Chicago Symphony Orchestra. That's right, he's got the most coveted gig in the brass universe -- and he's one of us! Martin sat down with us recently for a long video discussion, his first major interview with any news outlet since taking the job. This is a segment of part threethat session. If you're a DCI Season Pass subscriber, you can enjoy the entire series of interviews! If you're not, we'll be running shorter excerpts of the interview on DCI.org. If you're a DCI Season Pass subscriber and go to the DCI Insight section under the Off-Season Coverage drop-down menu. Not a DCI Season Pass subscriber? Subscribe now!